The simplest way to fix the ship injury system is just remove it. All it is now is a half hearted attempt at making death feel like it has a consequence. It obviously fails in that capacity so all it really ends up being as an annoyance. Simply put, it's a system that serves no real purpose and should just be removed from the game. Ok, nevermind that previous post. Just some nostalgia. I would make it such that damage on your ship can be repaired by either spending EC, crafting some components or taking salvage either from some place in the system (though that would mean editing all mission maps) or through a mini-game. They could even make a special mission where you take your ship through an asteroid belt to gather resources, or visit Utopia Planitia while your ship is being repaired where you will then have to assist with some tasks. While still retaining the option to just use EC or craft something. That would give us new missions, lead to more immersion for those who choose the mini-mission option, and it could serve as an EC or R&D particle sink which have often been argued to be necessary in the case of the former, and which I believe now to be necessary for the latter. I don't like the current system myself. I'd love more "battle damage" to be shown on a ship or character, or a skin option for each, to add immersion. But too many people complain about the injuries as is. Even though you can just handwave them away with a minor item that is easily stuffed in the bank. Hell, I grew up with D&D mechanics such as the Combat&Tactics critical hit chart, or the effects tables from Palladium's RIFTS. Loved those rules, though they couldn't work in Star Trek. But then again, Star Trek is a universe where there isn't a large amount of resource scarcity or physical cost when you get Popeye-punched, space or ground. Makes it tougher to come up with a system when everything is two-for-a-penny candy. And it's too "noblebright" of a setting to have such thing. I didn't realize today was opposite day. That's a horrible idea, possibly the worst I've ever heard concerning this game. If you want to permadeath, do it on your own and delete the character, don't drag everyone else down with you. It's not, today is forum-death-remembrance-day. And old-thread-reliving-day. To be fair, I almost never die as I build my ships such that I can survive and fight on my own if I have to. Such flexibility requires a balance between offensive and defensive abilities. But when players die, it should have some consequences. So I think that a mini-game (which, as said, could include a map like Utopia Planitia with a small mission as a bonus) or short R&D tasks/small EC costs are good alternatives. Why should players only earn stuff and resources from missions and not incur costs when they fail to do certain things like surviving? We have objectives that need to be met, a minimum amount of DPS you need to do to not get a penalty. Surviving or at least dealing with the costs of failing to do so should be just as important imo. The costs need not be large, it need not apply everywhere (normal difficulty could be excluded, maybe even advanced) and there could be free alternatives like a small mission that, if done right, doesn't need to feel like extra grind but rather a fun extra mission with an unique map. But that's what we already have. 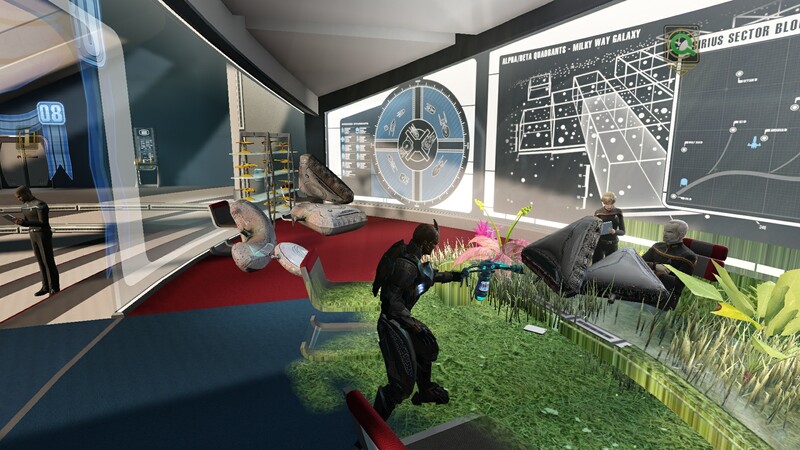 Spend EC and inventory space on cheapo repair items or play hide-and seek with an NPC to repair you for free. That's not good. Instantly repairing things isn't a challenge and quite frankly an EC cost would very much need to be large to be relevant at all except for newbies. 1. Waiting for your crew to do the repairs. Which would, obviously, go a lot slower if not stop completely if you're flying around and/or fighting at the same time. 2. Repairing things yourself. A set of maintenance minigames. Some things could require specific class or specialization, possibly certain number of specific boffs to assist you, and/or there could be separate repair skills to level up. There could even be variants to play when not damaged to get some advantage like the buffs currently given by doff assignments or leveling a second ship mastery tree or something. 3. Paying premium currency (dil or zen) to "finish now" on the timer. This would add interesting gameplay, provide incentive to avoid damage, yet allow for a player who was completely disabled by damage and unable to repair, to always wait out the timer (perhaps switch to another ship to play in the meantime). Another interesting thing could be getting our equipment damaged and have to repair them or replace with something else. There are way more important issues to be addressed than improvements on the Injuries. This chore is a chore by istelf, but by design. I'd as far as saying that they could be removing them all the way since that would incentivize the users to also try more challenging content without being punished for a random warp core breach killing them or a fail team beng unable to contribute, leading the competent users into dying and respawning gimped. Yeah they should. When I have injuries right now they dont do anything so whats the point of even having them? In NW when you get hurt you move slower, have less HP, CD's are longer and do less dmg based on what part of the body is hurt. I would like to see this come over sto so injuries mean something.